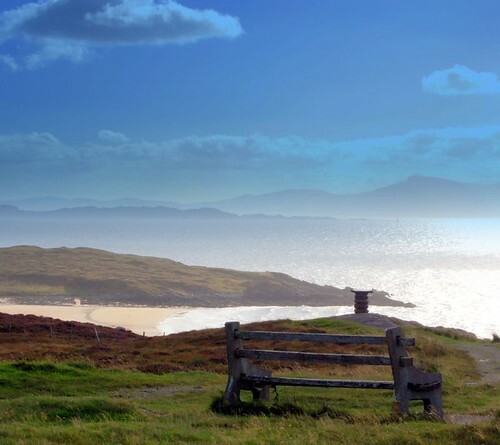 A fairly short walk out towards the headland at Redpoint with its fantastic views over to Skye as well the mountains at Flowerdale and Sheildaig forests. The route followed the southern end of Loch Gairloch and was an easy route to cycle and walk without major hills to cope with. The route went through the little village of Badachro, a lovely sheltered anchorage for yachts. As I travelled further west towards Redpoint, the vista opened up and as I rounded the corner at Port Henderson, I could look across and see the northern tip of Skye and further south the lighthouse on the island on Rona. Redpoint itself is just a placename on a map, with only a farm at the end of the single track road. However there is a beautiful sandy beach there protected by high sandy dunes and the viewpoint (above) gives an indication of the incredible views afforded from this spot. This entry was posted on Sunday, September 16th, 2007 at 11:27 pm and is filed under life, photography, Scotland, trail, Travel, trek, walk. You can follow any responses to this entry through the RSS 2.0 feed. You can leave a response, or trackback from your own site.